Monkey found a new home and will be missed. Since we took him in we also took in Riza a nice little Silver mitt girl. They are leaving us together to go to a new Family who is anxious to get them. The two older boys have been saving for a year so they could provide a good home. The whole family is excited to have a couple of fuzzies comming to live with them. I have a 17 year old son who has two 15 month old female sable ferrets. These girls really need a new home. My son is busy with school, a part-time job and a full time girlfriend and is giving these ferrets NO attention whatsoever. It is to the point that I'm having to make him clean their cage, feed and water them. They are staying cooped up in their cage, in the garage, all the time now. I've been trying to find a home for them for many months but have yet to find anyone that I think is suitable. I really want them to go to someone who will love them for the rest of their lives and who will give them the attention and care they need and deserve. We have taken in Shadow and Phantom both are sweet boys about 2-3 years old. A perfect age for first ferrets. They have been good about hitting the litter pan. Shadow a black sable with a silver undercoat is a kisser, who seem to like to cuddle. Phantom a lite chocolate is a little more wired. Both are healthy but they did not come with vet records so need to be vetted soon. Both have tested ADV neg. Update on Shadow and Phantom. We have had them to the vet and they are now current on their shots. In addition they had ultrasounds done because a new ultrasound tech needed training. “Chaos and Mayhem were raised together in a 2x2x2 glass aquarium in a pet shop, with no litter box, until we came along and brought them home when they were 7 months old. Mayhem has become an absolute sweetie (when he's not being Mr. Crazy Weasel and War Dancing throughout the living room...) Chaos, our "Otterish Boy," is also very sweet but has not healed emotionally even now from his 7 mos confinement. He cannot stand being caged (here he has a room with his brother during the day, and playtimes in the rest of the house morning and night). He doesn't seem to sleep as much as other ferrets, and this probably made being in that little cube that much harder. He thinks a litter box is either a bed to sleep in or a thing to play with - he uses the bare corners in the floor of the room. He's obsessive about having to have food available, though we've rarely let them run out of food, so maybe the pet store didn't feed them like they should have. And, last but not least - he bites faces. He needs a loving home with space, his brother, and people who understand (as it took us time to learn) that ANY form of hitting for punishment (even a tap on the nose, which is what we tried) will make him bite MORE, not less, and that only very patient love and vigilance will help him heal. He is truly a wonderful boy and loves to play - especially with a pan of water! - but he is not a ferret for the casual pet owner. Can you help us find a home that will take both of these boys? Mayhem would be fine without Chaos after a while, but I don't think Chaos would do well at all without Mayhem - so they must go together.” Both are currently healthy and happy just nneding a new home. 4 nice males were left with them to find a new home. We looked them over this morning and they all appear to be in great shape. 2 are albino’s big white and beautiful. The other 2 are a chocolate and a sable. All look to be between 1.5-4 years old. They are very sweet and friendly and none made any attempt to bite but 2 were snuggly and kissy in the few minutes we held them. They are currently available for no fee at Carolina Pet Supply 322 McCormick St. Garner, NC 27529 (919)773-0014. They also have all the supplies you would need to get them settled into a new home. I have three ferrets that need a better home than I can give. I don't have enough time to play with them or give them the attention they deserve. They are all three around two years old and very healthy and rambunctious. I love them to death,but I think someone with more time could love them better. I am located in Raleigh. I would prefer that the three stay together as they have been together their whole lives. There is a picture of all three at the bottom. From left to right: Hunny, Gwenddydd (the last two d's make a "th" sound), and Fatty Too Fat Boxer. Adopted to Michelle and Family. She wanted 2 for the boys and fell in love with them all. 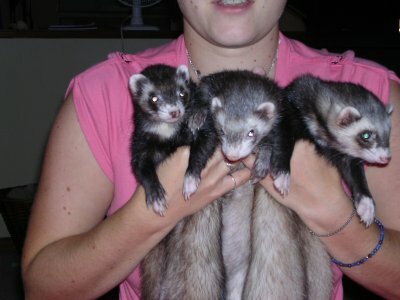 Also available 10/19/04 are 4 ferrets that are located in the Clayton area. They have also been together since they were kits. They were bought for the kids when the kids were younger, now the kids have gotten a little older they don’t have the time to spend with the ferrets that they used to. They are all friendly loving and healthy and are available for immediate adoption. I don’t know what all of the colors are but I know at least one is cinnamon. Stinky was connected with a new mom. The new mom promptly determined she was a girl and renamed her Sweets. Sweets is doing great in her new home and we hope to have a picture soon. Bossman and Zero have found a new home. They were with us about 6 mo and are great lovable guys. They are both about 4 years old and in good health. Amos and Spaz were placed in a great life home. They now own some very experienced ferret folks. Along with the new home came new names Hamish and Kali. We are told that after tearing around the new digs for a day they are now settled in nicely and feeling very loved. Hamish and Kali are doing great Hamish came to the ren faire and wowed everyone with his dashing good looks and charming personality.